Leicester manager Claudio Ranieri branded Arsene Wenger "a joker" as he played down his side's chances of winning the Premier League this season. Arsenal boss Wenger had said league leaders Leicester "cannot be ruled out" as contenders but Ranieri says survival is the immediate aim. "Thank you to Arsene but he's a joker. He knows the truth very well," said the Italian. "The league is very strange and open but our goal is 40 points." Ranieri added: "Our goal at the moment is this but let me see the next two months and then maybe I change the goal. "Like everybody else I am also curious in these days to watch my team, and to see how we respond in these big matches." Title challengers next year instead? 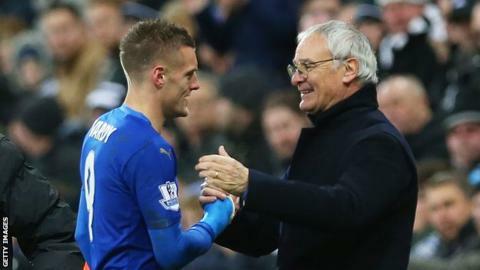 At a news conference before Leicester host second-placed Manchester on Saturday (17:30 GMT), Ranieri was asked about Leicester's ambitions for the future - and whether he would understand if striker Jamie Vardy wanted to leave to further his career. Vardy, 28, is the league's top scorer with 13 goals, and will break former Manchester United striker Ruud van Nistelrooy's record of scoring in 10 consecutive Premier League matches if he adds a 14th on Saturday. "I hope for him he can break it. Jamie deserves it. I think we are building a very good construction. Jamie can continue to show his strength with us. Him, Riyad Mahrez, and everybody," Ranieri said. "I believe that next year Leicester's role is going to go up and [will] become a battle with the top. I spoke to the owners in July and this is our project. "It is an ambitious project but I said: 'OK, I am ready'. People believe in me - I believe in me too." United manager Louis van Gaal has recently been criticised, with former Red Devils coach Rene Meulensteen following ex-midfielder Paul Scholes in bemoaning the side's style of play. Ranieri has come up against Louis van Gaal seven times in his career as a manager - losing four matches and winning three - and gave his backing to the Dutchman's work at Old Trafford. "He is a fantastic manager. The respect is very big. Under him United are slowly, slowly getting better, he is building," said Ranieri. "From last season to this season, now the defence line is fantastic and it is difficult to break their lines. "When you play against great teams, you have to see how your team reacts. For us this is another match to know where we have to improve." Meanwhile, Leicester have confirmed they will be enforcing strict security measures for Saturday's match following the Paris terror attacks on 13 November.